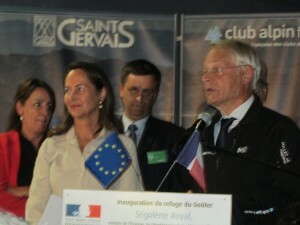 When the Saint Gervais mayor and the president of the French Alpine Club together with several officials and mountain guides returned from the Goûter hut after celebrating its inauguration with a small crew, (the shelter is operational since the 2013 summer), the ”Grand Official Show” could begin at the Espace Mont-Blanc in Saint-Gervais on September 6, featuring the well publicized Minister for Ecology, Sustainable Development and Energy, Ségolène Royal in person. The Ministerial Siren, singing a well rounded ecological song introduced to this vibrant parterre the delicate subject of Energy Transition “The “Goûter hut” proves that today in France the technologies to build positive energy buildings are real. If we can make such a building at the altitude of 3,800 meters, we can do the same at lower elevations. Thus, from now on , all new French public buildings should be of positive energy “, said the minister, while the law on energy transition is debated the present week at the National Assembly. Moreover, in his introduction, the mayor of Saint Gervais, Jean-Marc Peillex, which misses no opportunity to highlight his aspirations for a greater control over “his” royal way, has not failed to remind the incivility and risks taking actions identified and publicized this summer. For him, “awareness, prevention and education have shown their limits. It is becoming urgent that those who do not follow the mountain rules are punished [. . .] and to regulate access to the Mont Blanc”. As he has become accustomed, the politician proposed several possible tracks, some of them surprising: enforce compulsory reservations at the hut through upstream controls, refurbish the old hut (opposing the obligation to demolish the old shelter as that was a condition for the creation of the new one) to increase (! I must be dreaming!) the sleeping capacity of the site, to fine those who are abusing the usage of rescue means, or assess the physical abilities of those attempting to climb Mont Blanc as it is done in other sports.